Not sure what copyright is all about? This session is a general overview of copyright with some straight talk about what it’s for, key exceptions like fair use, and different approaches to thinking about copyright for content you create as well as using others’ work. We'll also discuss Creative Commons licenses and how they can help you share your collections responsibly. In this modern world, exhibits are no longer confined to the four walls of our institutions. Virtual wall space provides unique opportunities for visitors to experience our collections from the comforts of their own homes. While technology presents us with great possibilities for creativity, it also can create stumbling blocks that stand in the way of realizing our visions. Costs, lack of technical know-how, and limitations on presentation can be daunting. This panel of speakers will discuss how they surmounted these issues to create engaging online exhibits. The use of forensic software and hardware, traditionally employed by law enforcement, has spread to special collections libraries and archives as they seek to preserve electronic records for future generations. This session will focus on the research and development of best practices and protocols for dealing with born-digital archival materials, and putting these into action using a real-life test case -- an external hard drive given to Boston College's John J. Burns Library as part of the personal papers of Irish soprano and harpist Mary O'Hara. So now that we’ve built it, how do we make certain that we’re maximizing the benefits of digital collections to our users? We will explore five-six key issues, including the impact of expanded collaboration, look at the role of community engagement, and address the issue of long term access to digital collections, to consider how the Massachusetts Digital Commonwealth will take its program to the next step. The presentation will include audience participation. Digital Commonwealth 2.0: It's Alive! This session will provide an overview of the newly launched Digital Commonwealth site. Take a tour through Massachusetts history courtesy of an astounding cornucopia of content and collections contributed by libraries, archives, and museums from across the state. A full demonstration of the system's capabilities will be provided, and participants will get an introduction to the workflows used to ingest objects via manual submission, batch upload, and OAI-PMH harvest. An overview of the architecture used to store, manage, and provide access to digital objects in the repository will be included; other topics will include content models, descriptive metadata, creating collections, access permissions, and how the site feeds content into the Digital Public Library of America. The Digital Public Library of America brings together the riches of America’s libraries, archives, and museums, and makes them freely available to the world. 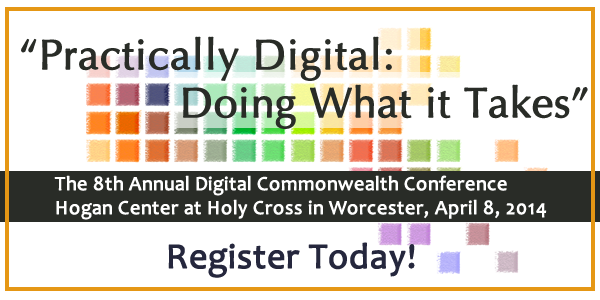 In this presentation, Franky Abbott will explain the DPLA's mission and strategies for building and displaying content aggregated from digital collections including state and regional libraries like Digital Commonwealth. This presentation will tell the story of the Massachusetts State Library’s project to conserve and digitize one of its most valuable resources, the 17th-century manuscript by Mayflower passenger and Plymouth settler William Bradford. Beth Carroll-Horrocks will describe the document and its author, the manuscript’s history of travels, the decision to preserve it, and the steps taken to secure funding and conservation services. Jessica Henze, the conservator who treated the volume, will present an account of the conservation and digitization performed by NEDCC. Grant-writing is grant-writing! However, all grant proposals contain certain core elements. This session will focus on the core components and approaches to writing grant proposals whether for digital or other projects. While this session will not guarantee you a successful proposal (no one can do that), it will enable you to approach proposal-writing in a systematic and thorough manner. Publishing digital assets online is just the first step in reaching your intended audience. Take the process further with audience engagement strategies that invite your audience to interact, collaborate and actively contribute in new and exciting ways. Engagement ideas range from tagging to crowdsourcing transcriptions to inviting new contributions to your collection. Panelists from the Cambridge Public Library and the Boston Bombing Digital Archive will share how they have integrated crowdsourcing and audience engagement activities into their online resources. Looking for new ideas or just want to see what other cultural institutions have done with their digitized materials? Join us for a lightning round of short presentations showcasing examples from some of the great projects enabled by BPL’s statewide digitization efforts. Learn how other libraries, museums, and cultural institutions have brought new audiences to their unique collections.